Ten people are invited to a mansion on the remote Soldier Island (Ni*** island, and Indian Island in earlier editions), by a mysterious host. When the guests arrive by boat, they are told that the host is not there, but will arrive soon. They notice a copy of the nursery rhyme, Ten Little Soldiers (Indians) hanging on the wall of their bedrooms. After dinner, the guests are all shocked to hear a gramophone recording accusing each of them of an unpunished murder in their past. There is a storm, making boats unable to reach the island. Events predicted by the nursery rhyme begin to come to pass, and as time goes on, suspicion and paranoia grow and civility breaks down. 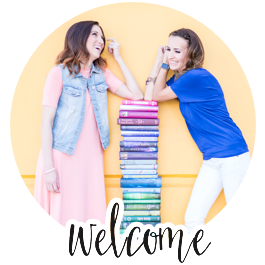 Angie moderated this book discussion, and started it out with a modified version of the poem in the book (ten little book club girls),and an enacted murder for us to figure out, which definitely set the mood for this book discussion! Download her brilliant and fun poem HERE! We discussed the theme of justice - did Wargrave act justly? Although technically carrying out justice, he is a worse person than his victims. What was Wargrave's motivation for the killings? - He wanted recognition of his cleverness, which is why he wrote everything down and put it in a bottle - romantic fancy and sadistic delight, a lust to kill, as well as a strong sense of justice. A desire to act instead of just judge. Class distinction plays an important part of the story - Wargrave is thought to be trustworthy because he is upper-class, as well as a justice of the law. No one saw the plot twist coming. This was interesting as it violates the usual standard rule of the mystery genre in that it makes it nearly impossible for the reader to figure it out. LOVED IT! It's interesting to re-read from the beginning of the book again because there is some foreshadowing but the reader generally couldn't pick up on it during the first reading. The killers thoughts, interactions throughout - some have a double meaning. When the reader suspects it might be "him," he gets killed off. Foreshadowing without making it obvious is a hard thing for a writer to do. The murders possibly seemed to be in order of how culpable Wargrave found the murderers to be. For example, the first death was Anthony Marsten. The deaths he caused were a result of his recklessness, but were not planned out or intended. The last death (other than Wargraves) was Vera Claythorne, who had planned for her young charge to die so she could get what she wanted. We discussed how we felt about the characters - you are sympathetic to them at first, you want to believe the deaths that they caused were accidents. It is interesting how some are consumed by guilt, and some seem to feel no guilt at all. It is also interesting to see how the different characters react to being confronted with their crimes. This book has been adapted to a play, as well as several film versions. In some of these, the ending is changed so that the last two characters do not die. How does this change the impact of the story? The idea was brought up that maybe the ending would be more satisfying if you didn't have ALL the answers laid out for you at the end. What do you think? 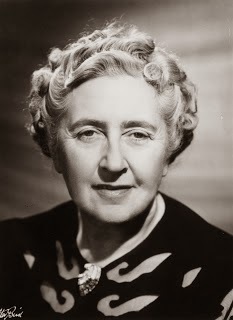 Agatha Christie is considered one of the best-selling authors of all time, outsold only by Shakespeare and the Bible. WOW. This story has had a huge cultural influence, and has been the inspiration for many subsequent works. "This is the story that made Agatha Christie the best-selling novelist of all time and is read the world over in more than 50 languages. “It was so difficult to do,” she writes, “that the idea had fascinated me.” It was an idea which is now the basis for many Hollywood horror films and has become a cliché to modern audiences, but it was Agatha Christie who was the first to do it and so successfully that the story has become her most adapted piece." To learn more about Agatha Christie's life and her literary works, go HERE. Agatha Christie, in words less than appreciative of her vast body of work, is the reigning queen of the detective mystery genre, even decades after she last wielded the pen. Reading 'And There Were None' cements this claim. Thrilling, entrancing and absolutely unputdownable in equal parts, this is her most successful of all works; if unpredictability is a meter gauge of success, that is. 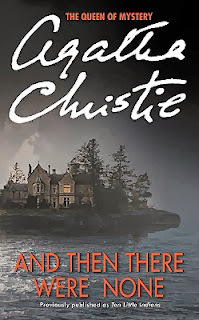 You need not be a detective mystery or Christie fan to appreciate this masterpiece, I recommend this to all literates around the world. Go right ahead, witness ingenious writing at its best and keep making conjectural guesses at the true identity of the killer, I'm sure the end will still be as much a surprise. I loved all the Agatha Christie mysteries. They make great audiobooks, too. Other contemporaries of hers who also wrote great mysteries were Ngaio Marsh and Josephine Tey. And of course, Dorothy Sayers, but you've already written about her! IF you want to make the certain policy for your work, thenyou have to see all the work and the aspects and the needs of the time. Just go to buy essays au and do the critical work with greater efficiency for a better result.